How did you find the sport of rowing? Or did it find you? 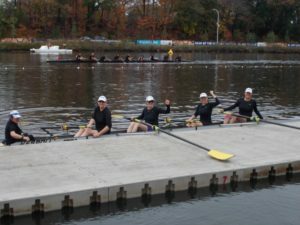 As a freshman in college in 1980, the women’s crew coach approached me at registration and asked if I would be interested in joining the crew team. So rowing found me! The thought of learning a new sport was intriguing but intimidating. I did not act on his suggestion and regretted it. But a seed had been planted. Fast forward 30 plus years later and my youngest is heading off to college. I sit down at the computer and type “Learn to Row” in the Google search bar. FVRA had a Learn to Row program scheduled for the very next weekend. It was a sign. I had finally found my way into a boat. What do you enjoy most about the sport? What do you enjoy most about FVRA? What keeps you coming back for more? The thing I love about rowing is that it is a great physical exercise and a great mental exercise as well. A rowing stroke is similar toa golf swing in that you can get the basics down pretty quickly, but it will take a lifetime to perfect. Input from coaches and fellow rowers can help you see nuances in the motion and make improvements. Rowing is always a work in progress. FVRA is a very supportive and collaborative group. We enjoy each other’s company and are blessed with a beautiful stretch of water. The challenge of the sport, the friendships, and the tranquility of a peaceful morning row are all factors that keep me coming back for more. Do you have any rowing-related goals for the 2018 season? What are they? The sport of rowing includes both sweep rowing and sculling. Everyone has a preference. Sculling is different from sweep rowing in that you hold two separate, shorter oars instead of one. In sweep rowing your hands work together to move one oar through space. In sculling your hands are moving independently. It may seem to a casual observer that the hands are doing exactly the same thing in unison, but it is a lot more complicated. As Rick Ricci (renowned rowing coach) would say, “Sculling is a contralateral movement in a bilateral environment.” This makes sculling more of a challenge and therefore more fun (for me)! Are you facing any challenges in the sport, and how are you overcoming them? Usually the challenge for me with exercise is finding the motivation to get off the couch. That is not a problem when it comes to rowing. Now that the weather is cooperating, I will row every day if given the chance. Sometimes I’ll row twice a day. It is an addictive sport. As adults, we all have complicated lives with work and family responsibilities. Coordinating schedules and finding the time to get out on the water is the biggest challenge. Do you have any advice for someone who wants to start rowing? 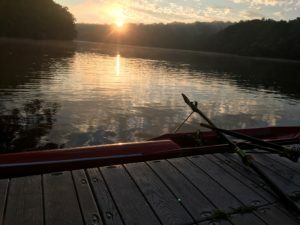 My advice for someone who wants to learn how to row is not to wait 30 years. Just get in a boat. There are people who will help you figure it out. Carpe Diem!